This booklet is a quick reference guide describing indicators and warnings related to homemade explosives. 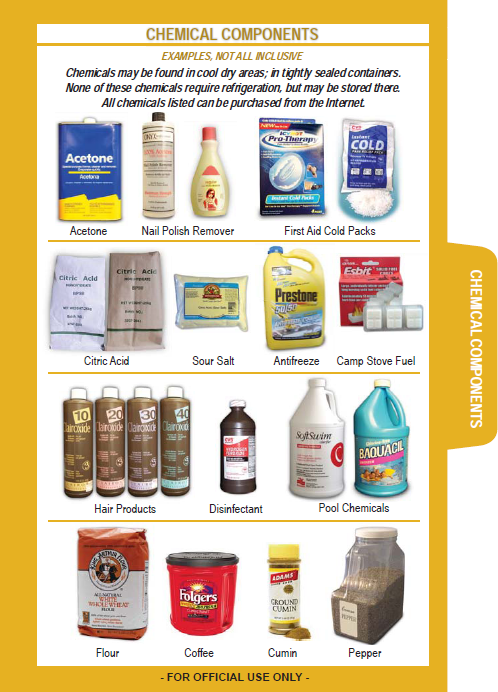 It is intended to aid military, federal, state, and local law enforcement personnel to visually recognize the materials, chemicals, and equipment associated with the manufacture of homemade explosives. The examples in this guide were selected based on historical incidents, intelligence on emerging threats, and the commercial availability of the components. 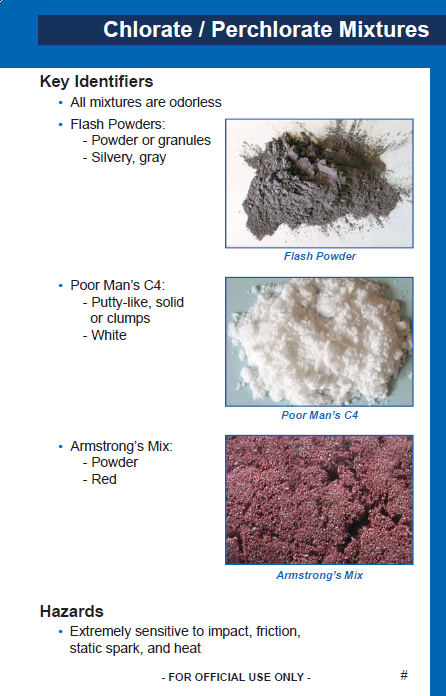 Given the variety of substitute materials available for the manufacture of homemade explosives, this guide should not be considered all inclusive. Instead, it should be used to establish a basic understanding of typical materials, chemicals, and equipment associated with the manufacture of homemade explosives and to enable on-scene personnel to determine if they are dealing with a potentially dangerous situation. The majority of this quick reference guide is tab-divided into three sections. 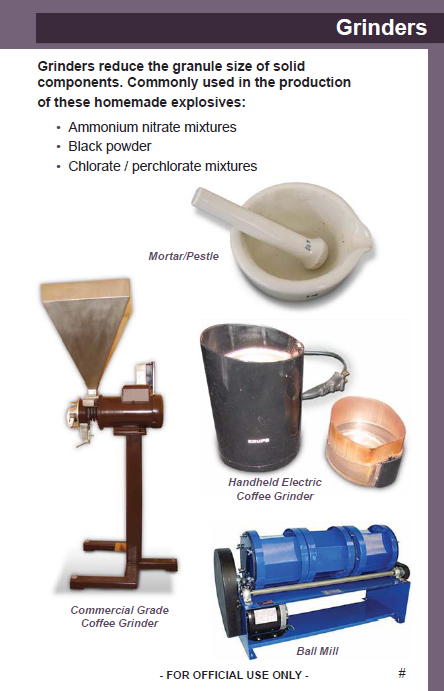 • Homemade Explosives describes the key identifiers, hazards, commercial uses, chemical components, and the equipment used in the manufacture of homemade explosives. 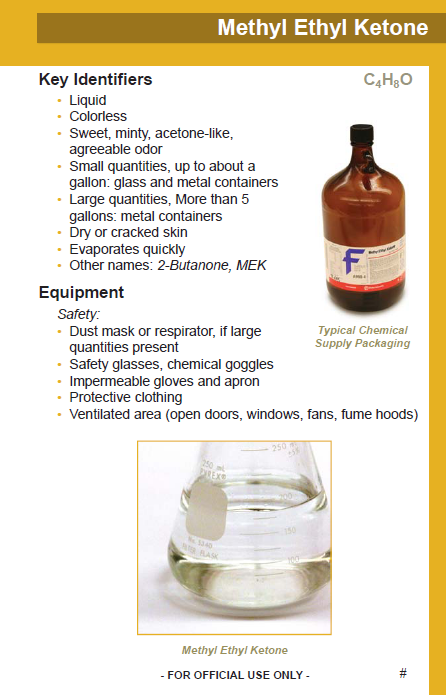 • Chemical Components describes the key identifiers, hazards, commercial uses, commercial sources, and the homemade explosive it can be used to create. • Manufacturing Equipment summarizes the laboratory and improvised equipment that can be utilized during the manufacturing process. 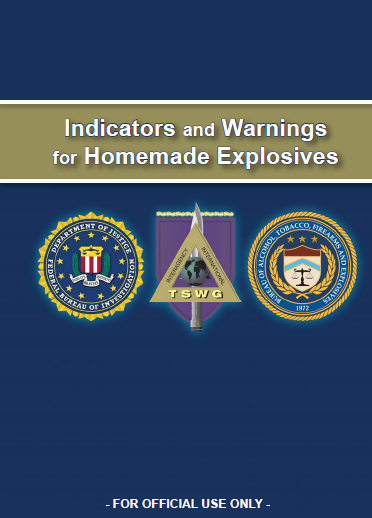 The Technical Support Working Group, Training Technology Development Subgroup, sponsored the development of this guide on Indicators and Warnings for Homemade Explosives with support from the Bureau of Alcohol, Tobacco, Firearms and Explosives (ATF) and the Federal Bureau of Investigation (FBI).